In what sense is the Earth, as distinct from life on it, evolving? Evolution is essentially change with time. We know of several distinct changes that took place over the first 500 million years of Earth history such as the formation of the atmosphere and the seas. Over the following several billion years many changes took place, from changes to the chemistry of the oceans and atmosphere, the evolution of volcanic systems and more especially the advent of plate tectonics as well as changes to the rock cycle — that is, weathering, erosion, transport, deposition, burial and uplift. And, from very early on, when life first evolved in the oceans possibly around 4 billion years ago it started to have a dramatic effect upon the Earth. The most significant advent was the evolution of cyanobacteria or blue-green algae, around 2.7 billion years ago, which generated oxygen and changed the chemistry of first the oceans and then the atmosphere. For most of Earth history, therefore, life has played an ever-increasing role in modifying how the Earth works. In your book The Burning Planet you explain that fire began to occur about 420 million years ago. Why did it take so long into the Earth’s multi-billion year history for this to happen, and what difference did it make? When cyanobacteria first evolved they lived in areas of the ocean that received sunlight. This was a relatively limited area and as a result the amount of oxygen was initially small and it all dissolved in ocean water. It was not until the oceans were fully oxygenated — a process that took the best part of two billion years — that it was able to build up in the atmosphere too. This accumulation led to a remarkable new stage in the evolution of the Earth. Ultraviolet radiation from the Sun turned oxygen high in the atmosphere into ozone, and the ozone began to act as a ‘shield’ in the sense that it blocked much of that radiation, which is harmful to life, from reaching the Earth’s surface. This made it possible for life to come out of the water onto land. In addition carbon dioxide levels in the atmosphere were falling as were global temperatures, all of which made the spread of life on to land more possible. It was not until around 630 million years ago that we find significant numbers of larger multicellular plants and animals in the oceans so in that sense the time lag to land colonisation is not so great. Land surfaces were transformed with the move of plant life from the aquatic to the terrestrial realm. Plants moved on to the land certainly by the late Silurian period, 420 million years ago. These plants were small and limited to where they could grow so the build up of sufficient fuel to burn would not be easy. Yet it is at that time we find the first evidence of fire with the occurrence of charcoal. And this tells us other things. We know from experiments that for plants to burn and a fire to be sustained we need around 17% oxygen in the atmosphere. So by the late Silurian we have the fuel and oxygen. Lightning would have been the primary means by which fires start. Plants on land helped in breaking down rocks to provide a soil as well as drawing down carbon dioxide from the atmosphere and giving off oxygen. Some of carbon of the plant material will have been locked up in charcoal and not recycled further reducing the amount of carbon dioxide in the atmosphere and this helped temperatures on land to fall making it more hospitable. Once fire was well-established on Earth, what roles did it play in the continuing evolution of life? For the first 50 million years or so atmospheric oxygen varied so that it was often below 17%. However, at the beginning of the Carboniferous period, around 360 million years ago, it rose to around the modern level, which is 21%, and then above it. By this time also trees had evolved and some plants developed seeds that allowed plants to spread into drier environments. Fire systems then became well established, therefore, through the Carboniferous and Permian 360-250 million years ago. A number of plants such as ferns were able to take advantage of regular fires as they could easily spread into burnt and disturbed environments. Other plants such as the newly evolved conifers developed strategies of dropping their branches so that surface fires did not spread up the trunks to create more devastating crown fires. We know that there were major changes on Earth around 250 million years ago at the end of the Permian, when life nearly died on Earth. But perhaps the most important phase of our story was in the Cretaceous, between 140 and 65 million years ago. At this time atmospheric oxygen levels were high and fires were large and regular. This affected herbivorous dinosaurs as for many their food source was destroyed. We might also speculate that flight in feathered dinosaurs might have been encouraged, as they had to flee such rapidly spreading fires. However, ferns were able to take advantage of the regularly burned areas, and then flowering plants that were initially fast growing weeds were able to spread more widely. We also know that many groups of plants evolved traits to cope with or use fire, such as the evolution of thick bark in Pines or regrowth strategies in Eucalypts or reproductive strategies in Proteas. By the end of the Cretaceous fire was playing a major role in stabilising atmospheric oxygen levels in the atmosphere. Around seven million years ago, when savanna grasslands spread across a dry Africa, plants began to take advantage of fire in an interesting new way. The grasses were able survive frequently relatively cool surface fires but these had the effect of killing shrubs and trees if the fires were frequent enough. Fire then maintains this ecosystem and the animals its supports. So what role did savanna grassland fires in the evolution of humans? Of course we can only speculate. Fires can kill animals as they pass though, but the flush of new vegetation following many fires would have a large number of animals that could be hunted. Walking humans would have been able to spot a fire from a long distance from the smoke plumes. We often think of the control of fire is a particular human trait so it would make sense that it took place in such a system. Humans would have first collected burning embers and deliberately kept the flame alight, perhaps using dung to conserve fire. This may have happened as far back as 1.5 million years ago or even earlier. However it was the ability to start a fire that was to prove so important. We have evidence for this ability from 40,000 years ago but it was probably long before that. How have humans used fire to transform the planet? The ability for humans to start and manipulate fire had a number of consequences. The first may have been to start a fire to drive animals for hunting. The discovery of dead, cooked animals that could be eaten would have also encouraged cooking. It has been said that this led directly to an improvement of social interaction and the development of language. However, it was the discovery that cereals, when cooked, could provide a sustainable food source was a game changer. This may have only been around 7,000 years ago in the Middle East. This meant that forest would be cut down, the wood used for fires, and the land transformed to agricultural land and the growth of crops. Humans also learned to manipulate surface fires in some woodlands to stimulate the production of acorns and chestnuts in some places. The development of ‘slash and burn’ agriculture, even in rainforest areas, also occurred. We also began to use fire in the development of industrial processes. Our greatest impact, however, was when we ‘put fire in a box’ and used combustion energy to power our developing towns and cities. The realization that this change has caused unwanted consequences has also had an impact on the public understanding of natural fire in the landscape where it has now often been demonized. It is certainly time to reassess humanity’s relationship with fire. A large number of those working in geology started young. It is the kind of topic that can capture the imagination of a young person, and that fascination and enthusiasm never leaves them. I started to collect pebbles as an eight year old, often agates from the shores of the Ayrshire coast in Scotland. I then moved on to minerals and by the time I was fourteen I was an avid collector of fossils. For a young amateur there is always seeing something no one else has or in the case of fossils finding one new to science. These rocks, minerals and fossils can tell us so much about the history of the planet and how we came to be here. The book by Jan Zalasiewicz is a real gem. It takes a simple pebble from the coast of Wales and unwraps its history. It takes us into the way we investigate the history of the Earth and step by step reveals the history of the pebble from the day the sediment was laid down at the bottom of the ocean to the burial and transformation to a rock through to when it was uplifted and eroded with much in between. What the book illustrates is not only how all the sciences are involved in unraveling the history of our planet but the sheer excitement of the discoveries and that there is a story for us all to unravel. What is so wonderful about geology is that anyone can make their own journey and all have the potential, however young or old, amateur of professional of finding out something new about the history of our planet. This is a book that I would have liked to have written. Perhaps I will. As Jan writes, “ pick up a pebble from somewhere else, and it will have other stories to tell”. It is certainly a wonderful start to make us think about our long past. 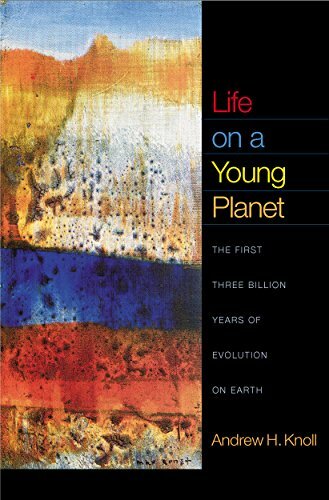 What about your second choice, Andrew Knoll’s Life on a Young Planet? It was not so long ago that many believed that life on Earth began in the Cambrian, perhaps around 540 million years ago. This is when the age of the earliest known fossils. It was only after the Second World War that evidence of microscopic life on Earth was recognized in the geological record. Even when I started my own studies the number of fossil sites was in the single figures. What geologists found once they knew where to look and what to look for were microscopic evidence of bacteria and algae – a record of more than 3 billion years. However what Andrew Knoll describes is not just an unexpected fossil record but also a record where the evolution of life has shaped our planet. Even today there is debate as to where life originated – many now believing that it was in the bottom of the ocean near black smokers where the bacteria could get energy from the centre of the Earth rather than from the sun. However a key change took place at around 2700 million years ago. This is the evolution of oxygen-generating cyanobacteria I referred to earlier. At first this oxygenation changed the chemistry of the oceans but later as oxygen leaked out into the atmosphere then an ozone layer could form, there was protection from the harmful ultraviolet radiation from the Sun and life could then venture onto land. This is a rich detective story involving all the sciences but nonetheless is written in an easy to read and engaging style by a researcher that has done so much to develop the field. His passion comes through. Knoll shows the intimate relationship between the evolution of life and the evolution of the planet. Our understanding of the earliest origin and evolution of life has made rapid progress over the last few years meaning that this book will continue to be updated by one of the world’s leading authorities. 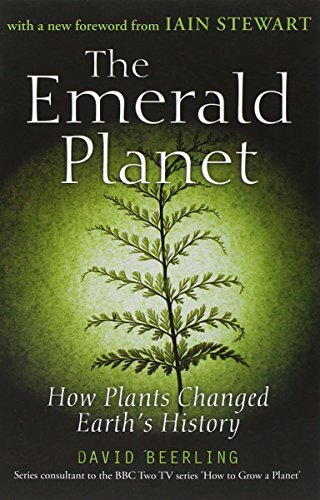 How does third choice, The Emerald Planet, enrich our understanding of how plants have changed the Earth? Our story that has started in the ocean now spreads on to the land. What was critical was the shielding of the land surface from ultra-violet radiation. Yet living on land as David Beerling points out did not come easily. Plants had already learned to take carbon dioxide from the atmosphere and through photosynthesis using the green pigment chlorophyll and some neat chemistry use that with sunlight to incorporate carbon into its ‘skeleton’ and generate oxygen as a waste product. Plants also needed a way to break down minerals in the rocks to be able to take up essential elements. Eventually plants found a way to develop a mutually beneficial relationship with micorrhyzal fungi that aided this nutrient transfer. Plants also developed stomata, the gas exchange pores that regulated water loss and provided the conduit for carbon dioxide and oxygen. Plants also needed a more rigid skeleton and developed new materials such as lignin to strengthen the cellulosic cell walls of the plants. However, life on land did not just change what was on the surface but developed a whole new rock cycle that enhanced erosion and hence supply of sediment and nutrients to the oceans and had a major impact upon the carbon cycle that in turn had a major impact upon the atmosphere. Beerling clearly shows that plants shaped the world in which we live and played a more important role on the evolution of our planet than is often acknowledged. Even today there are geologists who do not appreciate just how fundamental the greening of the planet was, and that is even more the case for the general public who, understandably, are more taken with animals such as dinosaurs rather than plants upon which we all ultimately depend. 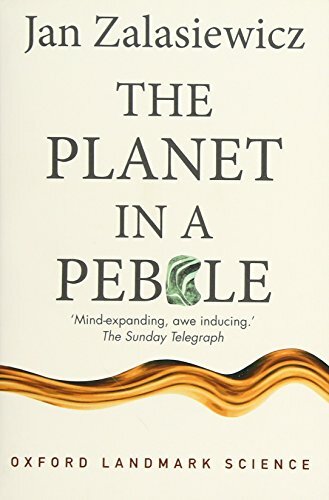 It was a desire to understand the early phase of how plants spread on to land and ultimately went on to form peats that were to become coal that I first thought of fire. It turns out that fire is a more significant force on Earth than many have appreciated and Beerling documents the early interest in the role that fire may have played in shaping our planet. Beerling emphasises just how much the Earth that we know today has been shaped by the plants that greened the land. While much is discussed about the blue planet he rightly takes us back to what is important for us – the emerald planet. Your fourth choice, Jenny Clack’s Gaining Ground is about animal evolution. How does this add to the picture? The story of vertebrates — fish, amphibians, reptiles, birds and mammals — resonates with many people more than do the stories of plants or invertebrate animals. How did animals first come out on to land and what were they like? It is clear that there was some considerable time between when plants spread across the landscape and when amphibians made the first tentative steps to move into this vegetated landscape. 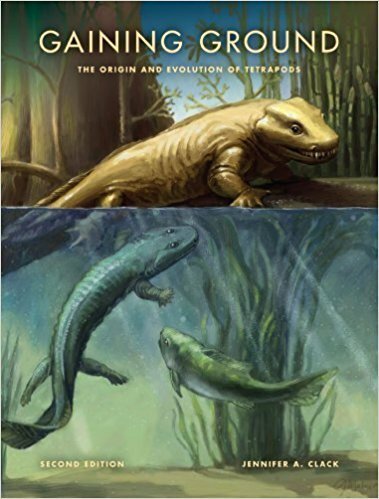 In this most absorbing book, Jenny spends some time discussing how the earliest vertebrates came out on to land. However, for me the most interesting part was in the Carboniferous Period, some 325 million years ago, when we encounter a wide range of small tetrapods, many of which were discovered at East Kirkton, near Edinburgh in Scotland. This is where my own story and Jenny’s intersect, as well as our books. 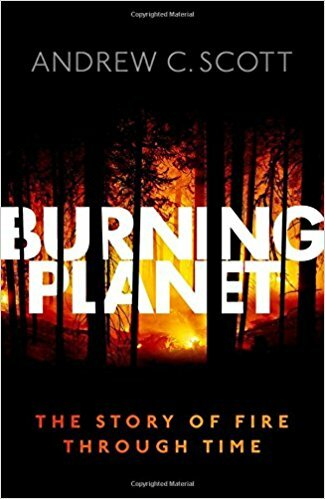 In Burning Planet, I discuss some of the charcoal I found in rocks of this period across Scotland. I had been helped in some of my early excavations by a local man named Stan Wood. Stan had first found extraordinary fossils of early animals in a dry stone wall surrounding a football pitch during a half time break of a match at which he was the referee! This led him to explore a nearby quarry and to involve what is now the National Scottish Museum. I love this story as it shows how anyone, professional or amateur, with a passion for fossils can find amazing things at any time of life. The excavation of the site became an international multidisciplinary affair and I was tasked at coordinating studies of the fossil plants and even named one Stanwoodia, after Stan. However it was the animals that received the most attention with one Westlothiana being heralded as the first reptile. Jenny has spent over 20 years describing the animals from the site and she relates this with great clarity in her book that is now in its second edition. She has been able to show that many of these animals belong to basal stem groups but were very diverse. Jenny Clack highlights another locality that plays a significant role in tetrapod evolution at Joggins in Nova Scotia, where one of the first clearly reptilian tetrapods were first found by William Dawson and Charles Lyell in the 1850s within tree stumps. As I document in Burning Planet, these were also associated with charcoal and fire again may have played a significant role on the ecosystems where they were living. Fire and also partly responsible for their ultimate preservation. What becomes clear is that we should consider the evolution of the whole ecosystem and not just a part. One significant difficulty is that whereas many of the animals from this period of time have been reconstructed, many of the plants have not, and this leads to a problem of how to represent the animals within the correct landscape. This is a story that will run and run. 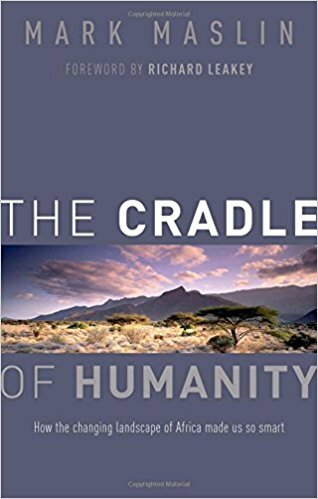 Your final choice is Mark Maslin’s The Cradle of Humanity: How the changing landscape of Africa made us so smart. What does this book say about our latest understanding of the human origin, and how does Maslin answer the riddle in his title? Mark integrates not only geology, palaeontology and archeology in this book but also climate and vegetation change. He considers many of the new fossil finds and puts them into context. This is an excellent summary and shows how much we have learned over the past forty years or so. I well remember Richard Leakeiy coming to speak to my class as an undergraduate in the early 1970s and telling us about the new exciting finds in Kenya. It was particularly intriguing for me to read Richard’s preface to the book by Mark Maslin. What is particularly important is the geological context in which these early hominid finds have been found. We know now much more about the changing climate and vegetation of Africa at this time. I was pleased also to see the volcanology here as well as discussion of the environment as a whole. As an undergraduate I was taught by Basil King, a pioneer of the study of these volcanoes, and Bill Bishop, who studied the associated fauna that was found associated with the human remains. So I have always taken an interest in the African Story (another player in the story is Andrew Hill who helped demonstrate palaeontology to me as an undergraduate). A key part of Maslins’s thesis is that rapid periods of climate change, as he documents in Africa, was a key element in the rapid evolution and adaptation of humans. Humans are, arguably, the only species that not only adapts to new environments but also adapts their environment to themselves. This book is the first to document these environmental changes so carefully, putting forward a powerful argument that we should not consider the bones without their environmental context. What I find particularly interesting, however, is that there is no mention of fire. It is now clear that fire plays an important part of maintaining savanna ecosystems and providing a diverse landscape but it is only over the past few years that it has been considered significant in the evolution of our planet. Yet it is fire that has been claimed to define what it is to be human. Perhaps now we are at the beginning of a new quest to investigate the role of fire in Africa at the time of human origins and evolution.